Piano Nobile presents Albert Irvin and John Golding: Celebrating 10 Years at Kings Place, an exhibition showcasing two of the most distinctive abstract painters active in Britain since 1945. Ten years ago, an exhibition dedicated to Irvin’s work opened Kings Place. 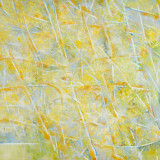 Now he returns, alongside John Golding his contemporary and fellow Abstract Expressionist. In relation to Albert Irvin and John Golding, David Anfam will give a talk at the British Art Fair on Thursday 20 September, starting at 4.30pm. Speaking about Golding's work in relation to Caro/Golding: In Conversation, the talk will introduce the topic of post-war abstraction in Britain. Anfam was acquainted with John Golding and has worked as a writer and curator in this field for several decades. The first major retrospective of Irvin’s work will be held at the Royal West of England Academy from 8th December 2018 – 3rd March 2019. For more information and a price list please contact the gallery.